Canada is the tenth largest economy in the world and has immense natural resources, a highly qualified labour force and sustained technological development. In 2017, the Canadian economy achieved its best performance since the global crisis. Its GDP reached USD1.64 trillion. The economy grew by 3%, the highest rate among G7 countries. It is expected to dip slightly in 2018 and 2019 (to around 2%). Unemployment is at its lowest rate since 1976 (5.8%). Inflation is stable, interest rates are low and salaries are rising again after a long period of stagnation. Household debt, however, remains high and the country’s balance of trade hovers in the red. Canada’s main economic sectors are services, agriculture, energy, telecommunications and aerospace. The extractive industries, mines and quarries, oil and gas as well as construction are the fastest-growing sectors. Meanwhile in the tertiary sector, the best-performing areas are wholesale trade, transport and storage, retail and professional and technical services. Canada’s preferred trading partners are the United States, China, the United Kingdom, Japan and Mexico. Its top 5 suppliers are the United States, China, Mexico, Germany and Japan. 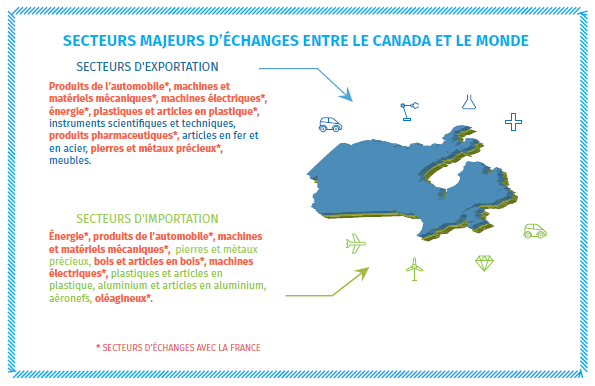 France ranks as Canada’s 9th largest trading partner, while Canada is France’s 17th outside of the EU. Exports to France represented CND3.4 billion in 2017 and imports, CND6.1 billion, making a trade deficit of CND2.7 billion. Canada is an important market for leading-edge sectors (aviation and aerospace, pharmaceuticals, measurement instrumentation, automotive) and for high value-added products (wines and spirits, food products, perfume and cosmetics). Since 1994, Canada has been a member of a free-trade area with the United States and Mexico; initially called NAFTA, since the new agreement signed in October 2018 it is now rebranded as USMCA. In 2017, Canada signed the CETA or Comprehensive Economic and Trade Agreement with the European Union. As well as reducing tariff barriers, this agreement eliminates numerous other obstacles to trade. Ranked 3rd in the world by the OECD for its quality of life, Canada has seen a regular progression in life expectancy (13th in the world for women, 11th for men). With its multicultural history, Canada registered the greatest growth in population among G7 countries in 2017, mainly due to an increase in immigration. 60% of its population lives in the provinces of Ontario and Quebec. The expression “Canadian mosaic” refers to the country’s ethnic and cultural multiplicity, not forgetting the great diversity that also exists from region to region. Be aware that Canadians don’t usually like generalisations made about them, Hence the importance of exploring the richness of their identity.